Culled from classic articles from Fine Woodworking magazine, master woodworker, owner and headmaster of The Centre for Furniture Craftsmanship Peter Korn covers virtually all the hand tools in the modern workshop. For convenience, tools are listed alphabetically within chapters organized by function, such as abrading, cutting, planing, sawing, etc. Beautifully illustrated, Korn’s Guide to Hand Tools explains what each tool is used for, which tools are essential for your shop, how to recognize quality when buying tools, how to tune-up tools for top performance, and in many cases, how to use each tool efficiently – all the information you need to get the best out of your tools. 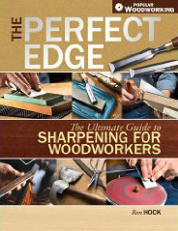 A definite resource for your go-to shelf in your woodworker’s library.